To compliment our other lines of rebuilt engine components for early VW vehicles, Vintage Werks maintains an inventory of rebuilt early carburetors of the type used on 25hp and 36hp VW beetle and transporter engines in production through the end of the 1960 model year. We only deal with original factory carburetors, i.e. German Solex 26VFIS or 28PCI with variable jetting depending on the year and application. Owing to customer requests, we have recently added 28 PICT, 28 PICT-1, 28 PICT-2 and 30 PICT-1 carburetors to our line. All carburetors have been restored in a manner described under our ‘Restoration Page’ and have been reassembled with careful attention to proper function of the linkage, accelerator pump and ball checks, and where applicable, choke circuit. In addition, all mating surfaces have been refaced to assure proper seating internally and with the manifold. 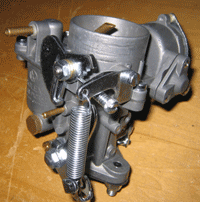 The carburetors are sold ready to bolt into your engine, complete with manifold gasket. 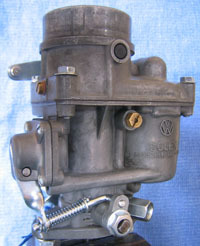 The 26VFIS, a very basic form of downdraft carburetor, was supplied with 25hp engine equipped VW beetles and transporters built before October 1952. It relied solely on air movement through the venturi to volatilize gasoline from the float bowl and consequently had some hesitation on acceleration. The 28PCI was introduced in October 1952 for the 25hp engine which remained in production through December 1953, along with many other changes to the VW beetle and remained in service on all 36hp engine equipped VW beetles and transporters through the end of production in August 1960. The 28PCI offered an improvement over its predecessor with the provision of an accelerator pump which helped engine acceleration and performance. Important jetting changes to the 28PCI accompanied the introduction of the 36hp engine in December 1953 and again when the 36hp engine was reconfigured in August 1954. For jetting specifications and chassis numbers refer to the 'Technical' page. The SOLEX 28PICT was introduced for the 1961 model year on the 40hp engine (1192cc) for both the beetle and transporter vehicles. This carburetor retained the same throat size as its predecessor the 28 PCI but unlike it incorporated an automatic choke circuit. Furthermore, the carburetor body was completely redesigned with the accelerator pump circuit mounted on the right side of the carburetor instead of the front. Other significant internal changes are also apparent including placement of various jets and the manner of their design. The 28 PICT remained in service from 1961 through 1963 when it was replaced by the 28 PICT-1 which was essentially identical to the 28 PICT with the exception of the automatic choke circuit. The former had a vacuum activated piston which activated the choke butterfly whereas the latter was equipped with a replaceable vacuum diaphragm. The 28 PICT-1 was used on the later 40hp engines (those with square boss heads) for 1964 and 1965. An even later version of this carburetor, the 28 PICT-2 was offered as a factory replacement sometime after 1965. It differed from the earlier versions in that it has an external spring return like the 30 PICT-1 and later carburetors to help return the accelerator linkage to idle. All three versions of the 28 PICT carburetor have an active power fuel circuit which draws fuel directly from the float bowl under engine load or high engine rpm. Further information including jetting specifications and chassis numbers may be found in the 'Technical' page. The 30 PICT-1 carburetor was first introduced with the new, larger displacement 1300 engine on the VW beetle for the 1966 model year. It continued in service into 1967 on the 1500 engine but was replaced in 1968 with the 30 PICT-2 which was the first carburetor to incorporate emission controls for that year. The 30 PICT-1 carburetor differs very little in appearance from the 28 PICT-1 and in fact mimics the design almost completely with the exception of a larger throat and venturi. 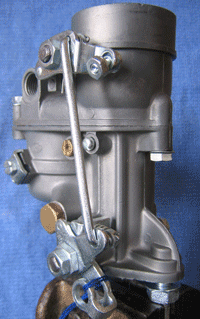 Three versions of the 30 PICT-1 carburetor appeared on beetle and transporter engines during 1966 and 1967. Designated VW47-1, VW75-1 and VW105-1, the first two were used on the 1300 engine for 1966 and had an inactive power fuel circuit. The third version, the VW105-1 resumed use of the power fuel circuit like the earlier 28 PICT carburetors but omits the ball check in the gallery. 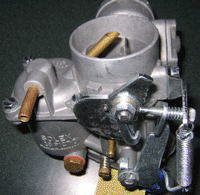 This enables this carburetor to pull fuel directly from the float bowl more efficiently than the earlier 28 PICT carburetors and derivatives.